So as seems to be my habit lately this post is VERY late. And I’ve actually written this one before part 2… There are a few reasons for that some of which is to attempt to word it correctly as it goes over what happened at St. Catharines. Although in saying that I could’ve just written this post, change the date to when this happened and none would be the wiser but I have INTEGRITY… Or like something… So this is why this is written this way. 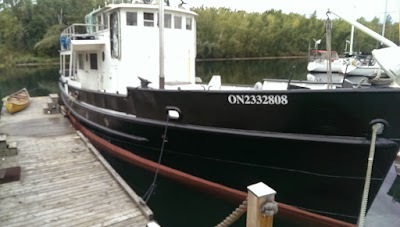 Our story begins on the Friday before this date when we got a phone call from Ship Shape telling us that they had launched my boat before our final inspection of the work they had done. I had been there the previous weekend sure but they had some spots to still paint by that time. I literally had to drive all the way there because they mentioned that there was a leak in the boat. A 2 to 3 hour drive down to where it had been launched and… no leak. There was a drip coming from around the propeller shaft but that’s normal with any shaft especially one that’s close to 4″ in diameter. So ya. I was not a happy bunny. We had called earlier in the week to ask them to delay the launch since the weather was bad and we’d like to launch on Monday. But they decided to go ahead with it anyways. Regardless that’s neither here nor there now since we were just happy to be almost out of there after being there a month longer than we were supposed to (details on what happened in part 2). After that fiasco I went back north and rested. We were going to head on out probably Tuesday since the weather looked calmish in comparison to the other days. Monday we head on down there, the lake looks calm. Yet Dad and myself had concerns. By the time we got there, got the ship ready to go underway, the batteries were charged enough to fire up the motor, and filled the tanks with diesel it was getting dark. Sure in a pinch we could go across like that but it’d be a bit difficult on ourselves. Remember by this point I had been couch surfing for 2 months and driving all over the place so I was really running on empty. Plus both of us were really not feeling particularly well so we looked at the weather report for Tuesday. Wind from the south, 20km/h, wave height 3 feet calming to less than that in the afternoon. Ok. So this’d be a bit of a rough crossing, but not too bad. We go to sleep at a hotel and got ready for an lunchtime launch. Well mother nature is nothing if not cruel at times and when we got there the wind had picked up and the weather report had turned a bit worse. But it still promised to calm down in the afternoon. We fire up the engines but it’s a fight to get on out. The wind was horrible. Despite the fact it said a wind from the south it appears to be coming from the south west. We head on out into the channel and that’s when we started to see what we were getting ourselves into. What followed next I’ll only relay in small bits of detail as even writing this is making me anxious. We were pounding through 2 meter waves getting out of the canal and being tossed and rolled all over the place. My Dad and myself were hanging on for dear life most of the way until we got a feel for how the waves were pushing us. We had waves crashing on the deck, crashing into the side of us 1/2 way up the galley door. Our decks were a complete wash for a great deal of the time. At times we must’ve rolled nearly 40 degrees to either side. Not a good situation for a ship that we had lightened by over 1/2 a tonne and has no keel to help right it (remember, cargo ship, they like to roll). This is by far the closest too… No. You know what… I was flat out terrified. As bad as our crossing to St. Catharines was, as bad as it was coming out of Cape Cod, this was worse and by far more dangerous. I actually contemplated writing a last email to Jeannie to tell her how important she was to me and that I’m sorry we didn’t make it back in 1 piece. No seriously. Part of what brought this on was what was going on in the galley and even more so below decks. The galley had at least 1 inch of water in it continuously, below decks water was pouring in through the cargo hold hatch and all the cabinets were tossed around. There was water firing out of the water tight hatch up forward but at that point I could barely see it so I had no full idea as to how bad it actually was. Also what didn’t help was I managed to get a few bars on my cellphone while we were crossing and I checked the weather report that had basically said when we left “rough but safe” and it had changed to “gale force winds, 2 meter+ waves, dangerous for any craft”. Basically 1 step below the worst it could get on the lakes. Our trip to St. Catharines took just over 2 hours in rough weather. Our trip back with the wind “helping” us took 4 and a 1/2. When we finally got closer to Toronto we had to turn into the waves directly to ensure we could get into the eastern gap and not end up at the Bluffs. When the action calmed down a bit Dad asked me to go below decks just to see what was going on there. Turns out that although the wood over the port holes in the bow was firmly wedged in place the water pounding it had blown some wood right off. I was up to my knees in water in the V-Birth. We still had an hour to go before we got to safety. Panic was about to rear its ugly head but we had made it 3 hours in this crap and were still on the right side of the water… the top side. When we finally made our last turn back towards the Eastern Gap we had 30 minutes or so to go before we got back. We noticed that the bow was low in the water but Pathfinder being the stout ship as normal plowed on. When we made the canal of the Eastern gap we finally relaxed a bit. My Dad had been at the wheel the entire time since I was basically useless for at least 75% of the time. I’m not proud of this fact at all. I didn’t throw up or anything but I simply don’t have experience piloting a vessel in seas that rough. I did what I could though, checked the engine, made sure the bilges weren’t totally overflowing, got drinks etc. We docked back at TIM and some people were quite surprised that we had made it there on that day at all since they weather report was as bad as it was. We pointed out that the weather report had started off saying it’d get better… then changed its mind. I busied myself sorting out lines and the carnage on our decks of stuff that had been lashed down but was now thrown everywhere, got the bilge pumps going as hard as possible, got power going again and tried to salvage what remained of the inside of the boat. When I had at least emptied a bit of it Dad and myself went straight to the bar and ordered rum straight up. I was soaked head to toe and freezing, Dad was sore as all hell from fighting the wheel that entire time. As a result we’ve set down ground rules for the lakes. Winds approaching 20km/h from anywhere can kiss our asses. I have to remind myself that although Pathfinder is ocean friendly and tough… the interior and its occupants are more designed for comfort. It’s war time days are over. Well… perhaps not entirely done as the next battle with Pathfinder began the very next day. But that’s for a different post. Big thanks to everyone for their support and help. HUGE thanks to my Dad for being the calmer head on this trip. I promise we’ll go for a calm cruise some time around the islands perhaps in 2015. This article was posted in Boat, Captains Log, Log, Renovations. I feel your pain! We were returning in the Dambach to Buffalo from Ashtabula and got caught in 2-meter seas. That was the closest I ever got to being sea sick. I spent most of the time below decks.